Friday-Sunday, 17-19 April: Of catching up – at last! So here we are, Monday morning, 20th April – my big day and big brother Ames’s birthday! Have a tub of ice-cream for me, mate, at 3.50, UK time, when I meet the multi-disciplinary team at C and W! I wrote the post yesterday but wanted to let it settle overnight before putting it up. I’ve just about caught up to the present, so the next post, to give you all a quick summary of the final diagnosis and prognosis, will either go up this evening or tomorrow, depending on how I react to what I’m told. Since the ‘phoney war’ ended, I’ve been living in a weird temporality. Sometimes today has felt aeons away these last three days, at others that it’s been approaching with the velocity of an express train. It was the right decision. A bowl of muesli and a cup of builder’s tea later and the ache is receding. By the time I meet my mate Gideon for lunch at our local Whole Foods cafe, after three hours typing, I’m neither aching nor radioactive – though I do feel whacked. Gideon was my Pilates teacher for many years and has played a prominent role in local environmental politics, spending a huge amount of time helping clean up the River Wandle (after which our borough is named), reintroducing trout into it (mostly immediately snaffled by the growing army of the hungry in London) and educating local school-children about the importance of caring for our rapidly-diminishing pool of natural resources. During a long and distinguished career as a Pilates teacher, Gideon has become increasingly interested in a holistic approach to health and stresses to me the importance of good diet and taking the right supplements to help my immune system in the weeks ahead. He gives me some uplifting stories of people who’ve battled back from apparently far worse scenarios to mine. This is my first introduction to so-called integrative approaches to cancer treatment. I have considerable sympathy for the approach, having long believed that mind, body, emotions (and, dare say the word, spirit!) are deeply inter-twined – one reason I’ve always taken lots of exercise. I’ve always eaten pretty well, too – a weakness for chocolate and ice-cream notwithstanding. It’s very rare that I eat anything fried or fatty and I haven’t bought red meat since 1980. Gideon suggests that I also think about a cancer-specific regime of recuperation through Pilates, mentioning a woman whom he helped a while back and who is another of the flourishing band of those who’ve battled back to health. It’s good to catch up. I’m particularly happy for Gideon that he’s recently met a new partner, an Australian woman called Charmaine, and the discernible uplift in his mood and bearing that this has wrought. There’s a lot more of this over the next few days. Anna has a university friend called Sara who retrained later as a nutritionist. Moreover, she has had a long-term relationship with someone who’s suffered from bladder cancer. She sends a preliminary overview of the ‘integrative approach,’ stressing the importance of tailoring nutrition intake to the specific drugs which may be used in treatment, some to neutralise certain key nutrients – or worse. It’s a very useful email but we decide we won’t take it any further until after Monday, when we’ve got the diagnosis. I can’t help but recognise that Sara’s probably right that most cancer doctors and consultants know very little about nutrition beyond what common-sense dictates. Otherwise why would hospital food be so appalling? I’ve been feeling more and more tired as the day’s worn on and hope it’s attributable to the effects of the Isotope. However, knowing that Anna is pretty tired, too, I’ve been out to get the ingredients for one of the dishes which Elena made last week-end, pasta in cheesy sauce, which Anna, Maddy and I all loved equally (the creaminess comes from the addition of Philadelphia to the usual cheddar and parmesan.) I’m looking forward to entertaining them at mine. Because I’ve been going so often to theirs, Maddy hasn’t stayed here since the before the kidney attack, more than two weeks ago. Consequently, Anna has had no night off either in all that time and I feel worried by how drawn she looks now. I don’t have any in stock. Nothing will persuade her, neither good or bad cop routines. For the first time in a very long while I feel myself growing angry with her. I manage to keep a lid on it while Anna and I eat. She, at least is very appreciative. Only when Maddy’s told there’ll be no ice-cream unless she eats something, at last, does she relent. She has the Moore-Gilbert addiction to the stuff. We compromise sorrowfully on a thick slice of wholemeal toast and some grapes. But when I get the ice-cream out, worse follows. It’s what she usually has for a treat when she stays on Fridays. I try to explain that there wasn’t any when I went shopping in ASDA this afternoon. She won’t accept it, tears of disappointment boiling down her face. Even Anna’s patience is wearing thin. We’re both exhausted and this is the last thing we need. ‘OK Maddy, I’m going to throw the new vanilla in the bin,’ I shout at her. Immediately, she concedes. She really hates it if I yell. She then proceeds very happily to tuck away a couple of scoops. My nerves are fried. And Anna’s, too. We’re in bed barely half-an-hour after our three-year-old. I wake up anxious about our Saturday jaunt to Sally’s. She’s invited us for lunch and to sit in the garden before she downloads a cache of convalescence music onto my Ipad. What if Maddy reacts to Sally’s food as she did mine? But my fears prove unfounded. After a good night’s sleep, she’s back on her usual gold-standard behaviour and even though she hasn’t seen our host since last year, well remembers the time she splashed in Sally’s kids’ pool, which is set up every summer for her army of great-nieces and nephews. Our host is a little discombobulated, having had the front of her car sheared off by a lorry a couple of hours earlier. Typically, she doesn’t make a fuss about what must have been a frightening experience, insisting she wasn’t going to postpone our visit for anything. 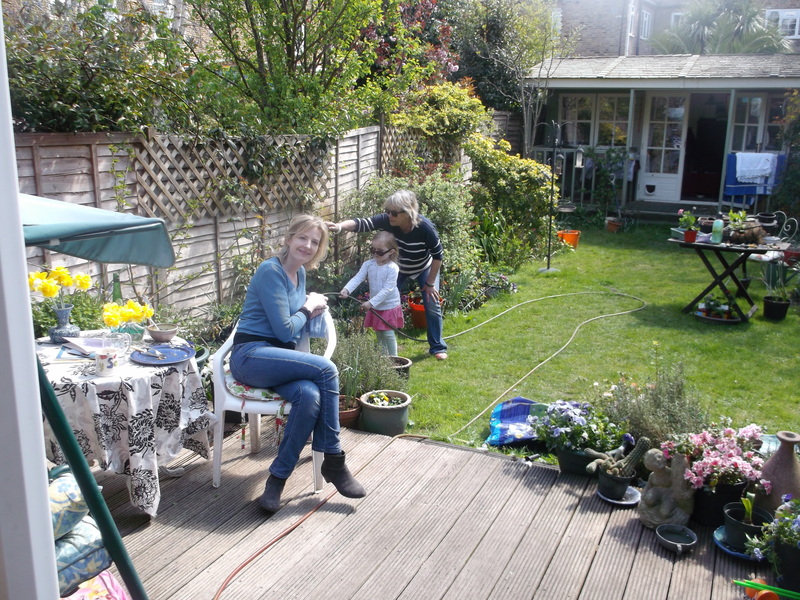 It’s so nice to sit outside for the first time this year in a garden, enjoying the sun and the abundance of spring colours which Sally has created. When I hear she has a student horticulturalist coming to help her out this afternoon, my ears prick up. My large roof terrace is in a pitiful state after winter, but I just don’t have the strength to shift tubs around and do the manual work that’s needed to get it all in order. However did I manage all those years until 2013 with that enormous garden in France, which I used to so love looking after, crazily abundant though it was? Suddenly I have the measure of my recent decline. Maddy and Sally are mutually charmed. Maddy adores the wooden summer house at the end of the garden, especially the idea that adults aren’t allowed in. When she’s explored her fill, she makes friends again with Minnie Mouse, Sally’s black cat; and helps her water the garden, just about resisting her mischievous urge to turn the hose on us. In turn our host finds her funny, engaging and very well-behaved, especially when she tucks in without complaint to a baked potato and cheese, demolishing even the skin, before turning her attentions to a plate of strawberries and a mini-ice. Naughty-nice Maddy. I’ve never known her to have a tantrum when we’re out visiting. While she does some colouring, I get more advice about ‘integrative’ approaches to cancer. Sally’s never suffered from it but has had several friends who have and has consequently built up some expertise in the same area that Sara specialises in. She suggests I shift my diet from an acid to an alkali one, which cancer apparently doesn’t like at all. Nothing fermented, so no more soya sauce, which I’m addicted to, no vinegars and a whole list besides, including a lot of dairy and wheat products. No more pasta in cheesy sauce! I already eat enough of the lentils, greens and nuts which are recommended but I decide I’ll try to substitute almond milk for cows,’ and get into more spelt and quinoa products – apparently highly alkali. Weirdly, lemons are alkali but not most other citrus fruit. Oh, and Vitamin D, which apparently too few people get enough of these days, because of all the health scares about being in the sun. She gives me a book, too, to remind me of what to eat and not. I feel a bit conflicted. But the turmeric tincture’s certainly worked and there doesn’t seem any harm in trying, depending on Monday’s diagnosis. Anna and Maddy leave soon after lunch to go and meet Anna’s friend Catriona, back in Clapham Junction. Sally’s gardener turns up and once she’s set him to work, we retire inside to download onto the Ipad. It takes us quite a while, partly because I’ve lost all my Apple ids and have to start again from the beginning. Duh! Boy am I tech-hopeless. Still it’s well worth persisting. I leave at tea-time with her gardener’s details and many gigabytes of music of every imaginable kind. I’m looking forward to several weeks’ listening. Sally and I have similar tastes, so I’m sure I’ll enjoy her selections. On the way home, the pubs outside West Brompton station are choked with football fans. Even though they’re Chelsea, mostly thick necks, beer-guts, shaved heads, tattoos, eyes slightly too close together, I can’t help feeling sorry for them – quite apart from their choice of team. They all seem to be red-faced from the sun, smoking vehemently and necking lakes of lager before their top of the table clash with Man U. I wish I could tell them about my tumour. But having had a few close shaves in the past with the most thuggish set of fans in English football (well, since the demise of Leeds United), I’m not going to risk annoying them. Something similar happened earlier in the week, when I was on my way to Anna’s. On a side-street, I passed four boys – none could have been older than ten, the youngest maybe six – all rolling cigarettes. My heart bled for them. Don’t they notice the army of the ill around us? Lately, I can’t keep help but notice the battalions of stoopers, shufflers, coughers, shakers, wheezers and stick-thin addicts on our pavements, not to mention the multiplying cohorts of the obese. Why should they? Before this malady befell me, I barely flicked them a glance, either. B’stard. The insouciance which health gives you. Back home, I rest for awhile, watching my own team, Arsenal, take on Reading, well towards the bottom of league below us, in the FA Cup semi-final. I can’t bear it for long. I’ve been saying for years that our once-great manager, Arsène Wenger, should pack his bags and fou le camp. Here we go again. Instead of respecting the opposition, – it doesn’t need a genius to deduce they couldn’t be more motivated for this biggest day of their football lives – he’s sent out half the second team and included defenders who haven’t played first-team football for months. Worst of all, he’s playing Aaron Ramsey on the right, where he laboured so unproductively for most of last season. We just scrape through, but only after extra time, and only thanks to a howler by the tiring Reading goal-keeper. Belying their position nearly forty league places below us, Reading fought us to a stand-still and deserved to go through more than we did. Wenger seems incapable of learning any lessons. After we were recently dumped out of the Champions League by unfancied Monaco, their manager rightly accused Wenger of arrogance, of treating the game as it has been won even before kick-off. Quite right! Arsene out! Still, I’m not so interested either in my team or football as a whole, now it’s been perverted into a monstrous, moneyed spectacle manipulated by non-dom crooks and Gulf oil oligarchs. 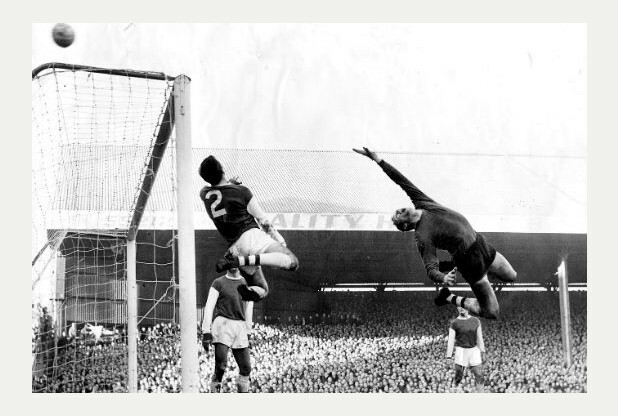 Standing watching Arsenal Reserves play Cardiff Reserves with 200 other saddos on a soaking Highbury evening in 1966 – that was real passion! Proper football! Highbury, c. 1966. ‘Fingers’ Furnell lives up to his name. No-one on the sardine-packed standing terraces behind had even heard of prawn sandwiches…. It’s a quiet evening at Anna’s, Maddy in a loving mood as she goes to bed. She’s starting to enjoy my new series of adventures involving Kaa, the snake from the Jungle Books who inadvertently falls asleep on a cargo boat in Mumbai and finds himself transported to New Orleans. Maddy particularly likes Kaa’s pronounced hisses, which I exaggerate even more to make her laugh, opportunistically making use of the inevitable ‘Mississipi.’ Anna and I again follow suit within less than an hour. At this rate Maddy will soon be putting us to bed. I don’t have a great night. No pain, but drenching night sweats again. I have to turn the duvet over each time I get back from the visits to the loo which my new-found determination to remain fully hydrated at all times have entailed. It’s sobering to wake on the last full day of truce before tomorrow’s meeting. Besides, excited by her prospect of a day out with Rosa and her family, Maddy’s decided to wake up soon after six-fifteen, something she hasn’t done for a long time. Thank God we all got an early night. After a very slow breakfast, Anna takes our daughter round to Imogen’s. It’s a bitter morning, with a nasty east wind and we’ve all had to put head-gear on. Yesterday, Anna and I came to the decision that she should take advantage of Maddy’s absence to try to get back into her work. The new term starts tomorrow and with all the upheavals of the last few weeks, I sense she isn’t really prepared psychologically for the exam-term rush. Besides, perhaps a few hours of reflection on my own will do me good, steel me for tomorrow without the danger of bringing her down. My plan was to swing by Battersea Park for an uplifting tour of its spring-time displays. All the cherries and May will be out, not to mention the blue-bells. But it’s so cold that I’m driven back towards mine. En route, I stop in at Il Molino, half-way between the two flats. There I bump into Johnny, an old mate from Pilates who lives round the corner from here. We catch up and he’s very supportive. ‘Community’ has become such a cant word, abused by politicians on the Right and Left seeking to ‘save’ public money by cutting back on essential services and dumping their hapless former beneficiaries onto ‘the community’ (i.e. charity.) Yet I feel grateful to have lived round here since 1980, acquiring in that time an ever-expanding acquaintanceship to supplement my friends. A cheering email from Haim awaits me. A group of prominent diaspora Jewish and Israeli academics have teamed up to condemn the cancellation of the Southampton conference as a serious assault on free speech and inquiry. Perhaps, with a lot of effort and the cultivation of such allies, this terrible wrong can be righted. But our grievance is put into perspective by the news that 700 migrants have drowned on their crossing between Libya and Europe. It’s sickening. But what to do? Ten thousand migrants have reached southern Europe in the last week alone, so this year’s total is likely to way exceed the 170,000 who made it in 2014. How many have been lost at sea on top of this? 10,000 in the last year? An Italian government official describes the trafficking as ‘the new slave trade.’ I’m not sure the analogy’s at all appropriate, but perhaps ‘we’ have to mobilise on a similarly grand scale as the Abolitionists to address this problem? I put up the last post and think about this one. As I’m doing so, I get an email from my brother Ames with a lovely picture of my mother in her pomp, in Africa, when he and I must have been about ten and eight respectively. I’ve never seen this one before and my heart melts as it rolls the years back. There she is, smiling, happy, youthful, the mother of four sons, yet slightly vulnerable and shy, with one of the pair of Congolese Grey family parrots she loved so much resting trustingly on her. She was heart-broken when one of them (I think Ruanda) escaped as it was being shipped back to England. Her buddy Urundi palpably suffered in the freezing cold, beneath the grey skies of England – as we all did. I was always thankful that Ruanda was spared his shivering and lonely fate and wished he’d managed to get away, too. Judging by Mum’s evidently recent hair-do, it must have been taken during some posting near Arusha or Dar-es-Salaam, probably the only two towns in colonial Tanganyika which could have supported such an establishment. She appears to look meaningfully at me, as if offering encouragement as I head down the path she’s travelled before me. It seems like such an encouraging omen to arrive just before the Big Day. It’s such a shame she didn’t live to see her new English grand-daughter. My mother Marise with Ruanda, Tanganyika, early 1960s. I read a bit of Sally’s book and head off to stock up on some of the basics she and it recommend. It’s an expensive business this. A brief visit to two different health shops and my wallet’s £100 lighter, just for some vitamin supplements, soya sauce substitute, non-wheat pasta, wheatgrass powder and a few bags of different nuts and seeds. Should I be going fully Organic, dragging Anna and Maddy behind me? On the one hand, it’ll cost a fortune. On the other, what’s the point of continuing to eat stuff covered with pesticides, especially when environmental pollution’s one of the factors most closely identified with kidney cancer. Well, let’s see what tomorrow brings before making any decisions on that score. I’d aimed to spend part of today formulating questions for the surgeon tomorrow. But it zips by and I’ve been too absorbed in other things. I feel calm and steady. The questions can wait until tomorrow, when Anna and I can write them down over lunch, before taking that uplifting walk in Battersea Park, en route to C and W. The forecast is for sun all day. As I prepare to turn in, I flick over the front page of the Guardian. The news about the Mediterranean migrants gets worse and worse. But here’s another good omen for me, in a piece on Timothy Spall, my favourite British actor, whose wife Shane I taught at Goldsmiths in the early 1990s. To my surprise, I learn that in 1996, Spall was diagnosed with acute myeloid leukaemia, a variety of cancer which sounds much nastier than mine, when he was 39. 85% of diagnoses lead to death within three months and Spall was only given a few days. Yet here he is, nineteen years later, talking about the latest work on his prolific and distinguished c.v. Wonderful!